The food hall, called Central Fare, will be anchored by Juvia Group’s La Estación American Brasserie, a 240-seat, 10,000-square-foot restaurant and bar with private event space and an open kitchen. Parliament Coffee & Espresso Bar is now open at the entrance of Central Fare. 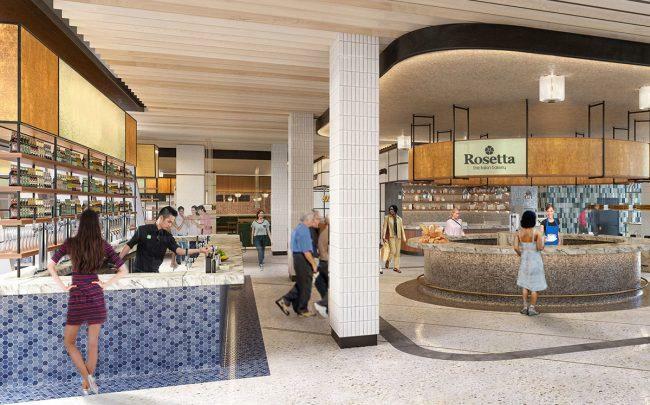 Rosetta Bakery will open “in the coming weeks” and 800º Woodfired Kitchen is set to open this fall, according to the release. Virgin Group founder Sir Richard Branson unveiled the re-branded mixed-use train station last week. Virgin Trains USA, formerly known as Brightline, won state approval for a $950 million bond issue to finance an extension of its rail service to Orlando. Flanigan’s Seafood Bar & Grill signed a lease in Sunrise. The South Florida chain of restaurants inked a 10-year lease for a nearly 6,900-square-foot space at 14301 West Sunrise Boulevard, just east of Sawgrass Mills. It will mark Flanigan’s 24th location. Lee & Associates’ Matt Rotolante, Vic Pastor and Nicole Messer brokered the deal. Flanigan’s is expected to open in early 2020. Macchialina is expanding to Coral Gables. The Italian restaurant in Miami Beach, led by chef and owner Michael Pirolo, is taking 5,400 square feet and an additional 3,000-square-foot patio at the Alhambra Towers, according to a release. The Allen Morris Company owns the 16-story, Class A office building at 121 Alhambra Plaza. Jonathan Carter of the Comras Co. represented the landlord and Justin Shultz and H3 Hospitality represented Macchialina. The restaurant’s other location is at 820 Alton Road. Celebrity chef José Andrés is out at SLS Brickell, just months after Michael Schwartz parted ways with his Fi’lia restaurant at the condo and hotel tower. Andrés’ seafood restaurant closed March 30, according to the Miami Herald. “Believe me when I tell you that was not my idea. Restaurant was performing great, better every day. But unfortunately, I didn’t (have) ownership of the space,” the Spanish-American chef tweeted. A representative for Andrés told the Herald that the hotel’s new ownership led to the restaurant closing. Related Group sold the hotel at 1300 South Miami Avenue in January for $43 million to Brickell Miami LLC, a Delaware company managed by Francois Faber of Fiduciaire Fernand Faber, an accounting and tax firm based in Luxembourg.